Beat 89% of your competitors by having a business mobile website! 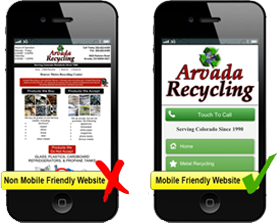 Receive a FREE mobile website for your recycling business today! Your mobile website will work on the most common smartphones including iPhone, Android, Blackberry and Windows Mobile. Your mobile website will have a click to call button for your customers to easily call you directly from their mobile device. 9 out of 10 mobile searches lead to action. Over half lead to a purchase. If you do not have a mobile website you are missing out on a major market of customers using their mobile devices to perform searches looking for the services that your recycling business provides. In 2013, mobile phones will overtake PCs as the most common Web access device worldwide. The number of people using smartphones to access and search the web is increasing each and everyday. Do not miss out on your chance to beat your competition and grab your slice of the pie.